Conservatives: What do you want to do? Liberals: A bunch of things that will hurt law-abiding gun owners, but won’t fix the problem! Liberals: WHY WON’T YOU ACT?!?!? Every time some terrorist, wacko or radical kills people, liberals always want to take guns away from the people who didn’t do it. Their unconstitutional goal is complete gun confiscation, something which would likely lead to mass violence against the people carrying it out along with the prominent people and government officials advocating it. The Founding Fathers understood that if the American people were ever disarmed, it would only be a matter of time until the guns of a fascistic government were pointed at the people. So wise Americans understand that an attempt at widespread gun confiscation in the United States may very well lead to large numbers of freedom loving civilians, cops and military members taking up arms to insure that we continue to live in a Constitutional Republic. Liberals would do well not to forget that. Setting aside the bloodbath that policy would likely lead to, it still wouldn’t solve the problem even if it worked. You can talk about the “success” of gun confiscation in Australia if you like, but it’s not a comparable situation. There are already large numbers of illegal guns in the United States and getting more firearms into the country isn’t going to be a big problem with our porous borders. You want to get rid of guns in the United States? But of course, calling for gun confiscation in the United States is widely unpopular and so many liberals won’t admit that’s what they want to do. So what other gun control laws could liberals implement that would stop mass shootings? If you want to know why, take a look at some of the most prominent shootings in recent years starting with Stephen Paddock in Las Vegas. Paddock killed 59 people with semi-automatic rifles, but he had no criminal record or known mental health issues and he passed a background check with ease. He did apparently use bump stocks on his guns to speed their rate of fire and even the NRA is on board with banning them. Would getting rid of bump stocks have stopped Paddock? No, but it MAY have reduced the body count. Keep in mind that bump stocks replicate a technique that can be learned; so he may have been able to do the same thing without a bump stock given time, practice and motivation, all of which he seems to have had. Then there’s Omar Mateen, the Pulse Nightclub shooter who gunned down 49 with a semi-automatic rifle. The Lone Wolf Jihadi bought his guns legally after passing a background check. What about Dylann Roof? The notorious racist killer who killed black Americans at a South Carolina church? He did pass his background check, but it was because of an error by the FBI screener looking at his application. Unlike the first two names on this list, he did his killing with a semi-automatic pistol. We also can’t forget Adam Lanza. Remember, the crazy kid who killed 26 at Sandy Hook? He murdered his own mother and took her guns. What law stops someone who is ready to kill his own mother? Jared Lee Loughner was forced to leave college because campus officials feared for the safety of students around him, but he wasn’t convicted of a crime. Therefore, he passed a background check to buy the Glock he used to kill 6 people and shoot Gabrielle Giffords in the head. Major Nidal Malik Hasan was caught talking to a radical, anti-American cleric, but our intelligence agencies just shrugged that off. Later, he passed a background check, bought a semi-automatic pistol and used it to murder people at Fort Hood. James Holmes was seeing a psychiatrist, but never spoke of any plans he had to hurt people, which would have legally required her to report it. Holmes passed a background check, bought weapons including a semi-automatic pistol, semi-automatic rifle and a shotgun and used his weapons to murder 12 people in an Aurora, Colorado theater. We can go on and on with this, but the point is that there is no magic fix. Want to reduce the size of high capacity magazines? Once you know your way around a gun, you can change out a magazine in less than 2 seconds. Furthermore, semi-automatic rifles, semi-automatic pistols and shotguns have all been used in mass killings. 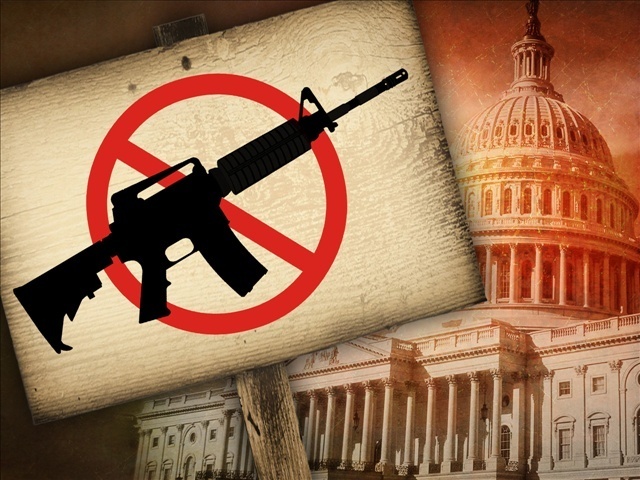 Banning one class of guns isn’t going to stop it. Additionally, as we discussed, banning all classes of guns wouldn’t end mass killings either. In Europe, where there already are the gun control laws liberals would love to implement, there are still gun massacres. One hundred thirty people were killed in a mass shooting with automatic weapons in France in 2015. Even if every gun on the planet magically disappeared tomorrow, the mass killings wouldn’t go away. In fact, the largest mass murders on American soil were committed with airplanes (9/11) and bombs (Oklahoma City). That seems especially noteworthy given that Paddock also had ammonium nitrate that could have been used to make a bomb. In 2016 in France, a man even killed 84 people by plowing through crowds with a truck. What, are we going to ban vehicles next? Get serious. Once someone’s mind is set on murder, there is no simple fix. So, how do you find the people bent on murder? Most of the time you don’t. Predicting which “moderate Muslim” will be radicalized and become a lone wolf killer is impossible. Predicting which mentally ill person will actually go around the bend and kill people isn’t doable. Some might be better bets to become violent than others, but the vast majority of people with mental illnesses don’t hurt anyone. Maybe getting God back in our schools, pushing Christian values and working on changing our “all attention is good attention” social-media-driven society might help, but I doubt liberals would be on board with any of those things. Long story short, gun control isn’t the fix for mass murders. If you want gun control so badly, move to the South Side of Chicago where it already exists and leave all of us law-abiding gun owners alone.